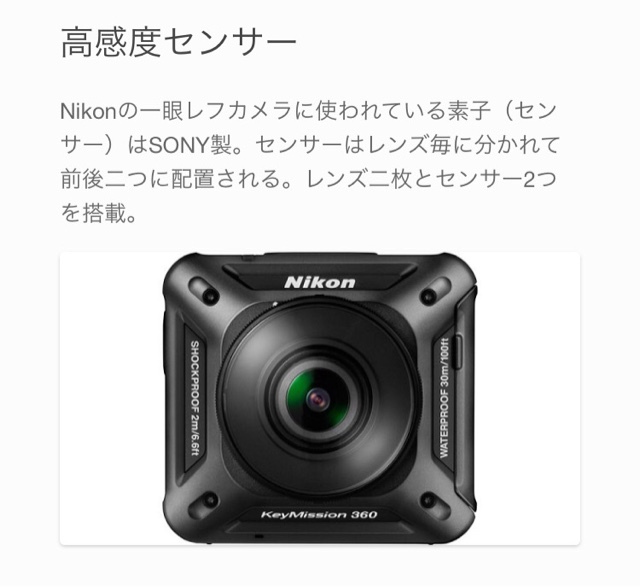 The Nikon Keymission 360 will have a high sensitivity Sony sensor, claims Japanese website ActionCam ( http://wearablecam.wp.xdomain.jp/box/260/ ). It appears they are basing their claim on the fact that sensors used in several of Nikon’s DSLRs are made by Sony. Sony sensors tend to have good dynamic range and wide exposure latitude, so if this is true, this, coupled with Nikon’s lens expertise, may bode well for the Keymission’s image quality.